WELCOME TO WASHINGTON MOOSE FAMILY CENTER #1080. We are located at 301 E. Highland Avenue, Washington, Indiana. 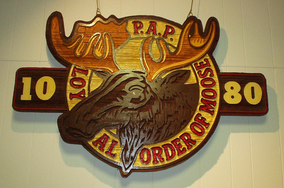 Our Lodge was instituted on August 16, 1912. We moved into our current location in 1958. The Lodge opens Monday through Friday at 1:00 PM and at 11:00 AM on Saturday. Sunday openings are scheduled for special events (Check the Current and Upcoming Events page on this site).